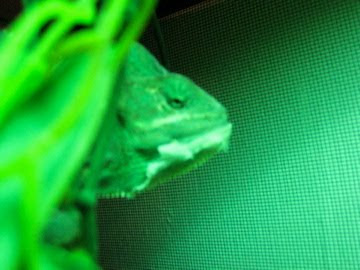 Live from the Chameleon Cage...SHEDDING! When I woke up this morning, there was a note waiting on my nightstand. It's from Child #4 who knows and shares my love of candy and jewelry. Happy Halloween back at you Child #4! We are going to have buckets of fun today. You will be a beautiful Cleopatra this evening. And I will be a scary pirate. This morning, there was a knock at my door. When I opened it, a large cardboard box sat on the stoop. 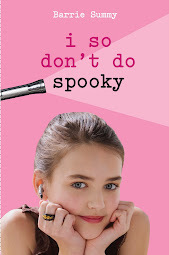 My author copies of the paperback version of I So Don't Do Mysteries! They'll be in bookstores around Nov. 10. For now, they're in my living room. And in my kitchen. And in my office. I'll probably carry them around with me for a few days, showing them the house, making sure they feel welcome. I'm really excited about the paperback and the new cover. But I'm also a little sad to say goodbye to the Sherry on the hardcover of I So Don't Do Mysteries. 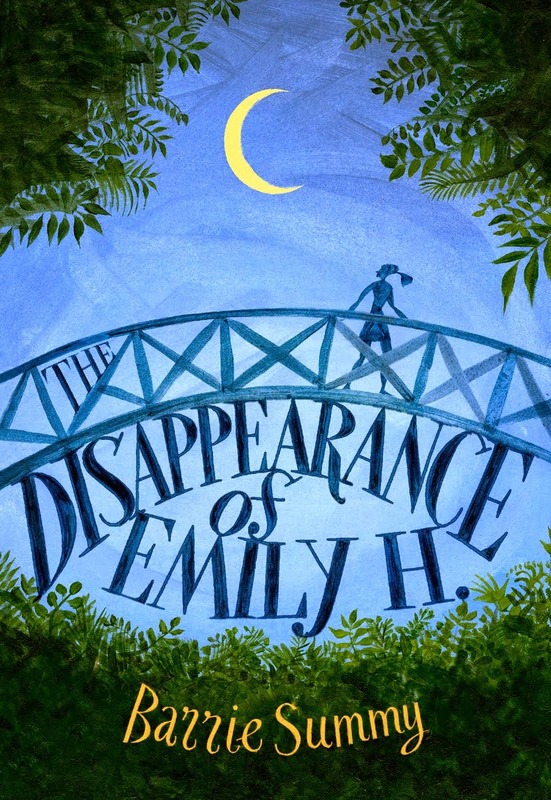 Of course, she'll always be on the hardcover of Mysteries, but that's the end of the line for her. 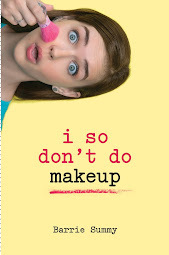 She won't be featured on the hardcover of I So Don't Do Spooky or I So Don't Do Makeup or I So Don't Do Famous. Sigh. And then I remembered a post I meant to put up back in September when I got back from Oklahoma. A post that really shows the old Sherry in a great light. Take a gander at the size of that cover!! Who created this amazing masterpiece? Here's a shot of Artist Maryann Walls standing next to Sherry. This is Robbie Wheeler, School Librarian Extraordinaire, who set up the school visit. There are many things to love about Robbie. She's friendly, organized, laughs at my jokes and brought me lunch. Not to mention that she loves putting students and books together. Thank you, Robbie Wheeler for inviting me for a school visit. Thank you, students and staff of Oakdale Elementary for a fun time. Thank you, Maryann Walls, for this larger-than-life Sherry! I was at the Southern California Independent Booksellers Association Authors' Feast this weekend. I got to hang out with lots of indie booksellers and lots of authors. Can I just say--people who love books know how to have a good time! While up in that neck of the woods, I returned to HOLLYWOOD. Hollyweird, oops, I mean Hollywood figures heavily in book #4, I So Don't Do Famous. So, armed with notebook and camera, I headed out to do some research. And,yes, Uncle Sam, I will be writing this trip off come tax time. 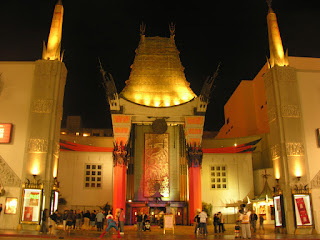 I took a tour of Grauman's Chinese Theater. The theater opened in 1927 and premiered The King of Kings. After a visit to China, Sid Grauman fell in love with the culture. He imported all manner of Chinese artifacts for the theater and even had Chinese artisans come and produce pieces. Today, this theater continues to be much sought after for movie premiers. Also, three Academy Awards have been held here. And now for some trivia I picked up on the tour. As you all know, outside the front of the theater are concrete blocks with celebrities' signatures, handprints and footprints. There are 247 of these blocks. According to Tour Guide Levi, they won't run out of room for 45-50 years. So, for those of you with this particular dream, THERE IS STILL TIME. One fine day in 1927, Silent Movie Actress Norma Talmadge was walking in front of the theater when they were pouring concrete. By accident, she stepped in said concrete. 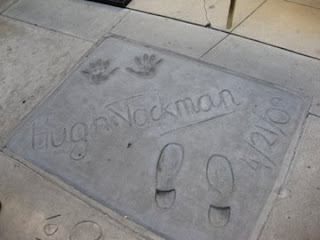 Sid Grauman saw this, had her add her signature and handprints and a tradition was born. 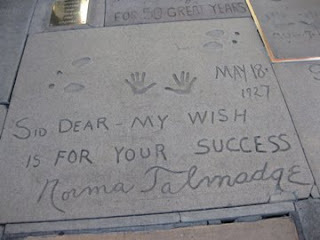 Lucky for Norma that she walked through Sid Grauman's wet cement and not mine. I would've yelled at her for messing up my new sidewalk. Hugh Jackman is the most recent addition to the forecourt (April 2009). Levi the Tour Guide may have shared with me who's next. Send me $100 and I will tell you whether or not I know. Marilyn Monroe wanted a diamond to dot the "i" in her name. The powers of the time refused on the grounds that the diamond would be stolen. Instead, they inserted a rhinestone. Within three days, someone tried to pry it out and succeeded in breaking off part of the stone. You can still see the knife marks. Not sure why anyone thought a rhinestone would be a safe bet! Anyway, I had a very fun weekend. My family, of course, missed me dreadfully and fell apart at the seams. Okay, fine, they had a fun weekend themselves back in San Diego with the school's Fall Carnival, a few water polo games, and a Brownie activity. Dorothy the Dog, however, really did miss me because no one fed her dinner for two nights! Lest you be tempted to call the Humane Society, let me assure you that she did have food and water, just not her FAVORITE dinner fare. Click here for links to more My Town Monday posts. (Thanks Clair for hosting) Also, if you're even mariginally thinking about writing a My-Town-Monday post, please do! Fair warning, though, it's addictive! Write your post, then leave a comment here and we'll link to you. There was a bit of a scuffle in the chameleon cage this morning when she ACCIDENTALLY stepped on him. He swiftly turned and bit her on the arm. If you don't want to get stepped on, quit making yourself look like a ficus leaf. Also, I understand that in the wild you two wouldn't choose to mate for life. Here in the Summy cage, though, we're all about monogamy. So, play nice, share the crickets and remember the golden rule. She's the mother of the 47 eggs currently basking in the incubator. For that alone, she deserves some respect. And here he is, looking all contrite and apologetic. Sorry for the absence. I'm "swamped." 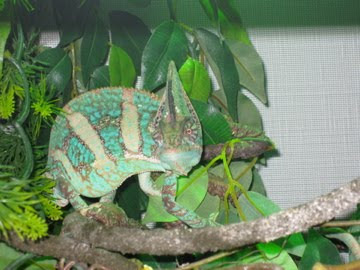 (a little chameleon humor....they live in rainy places) Although I truly am crazy-busy. I have a library visit at 5:30 - 7pm at the Santee Library. I'll be there with Cindy Pon and Laura Preble. Should be fun. I have a joke gift for them. I can't tell you what because you never know who's lurking. Mwaaaaa! 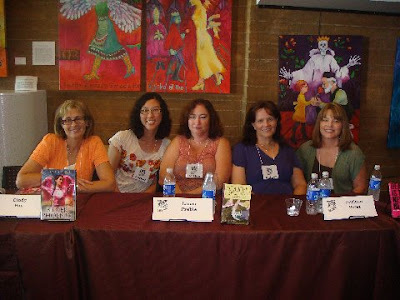 (L to R) The suspects: me, Cindy Pon, Laura Preble, Marlene Perez, Mary Pearson. This is pretty much a local yokel panel, although Marlene actually lives a little north of here, in Orange County. Oh, and, thank you, Mary, for the photo. I remembered to charge my camera, but then forgot to put the battery back in. This is only one of many reasons why I'm not a professional photographer. As previously mentioned, last Friday, I was on an authors' panel at the extremely cute, has-an-ocean-view Encinitas Library. It was part of the San Diego County Library's Book Festival. Very fun! And Marisa Lowe, the teen librarian from my very own branch, did a super job moderating. There were several things I liked about this event. I think we did a good job answering the questions. We were having fun, and I think that made the experience fun for the audience as well. I'm not particularly talented at speaking off the cuff, so I'm glad I had a chance to practice this. In terms of writing, it was interesting to see what we had in common and how we differed. And I LOVED the little personal connections I made with the other panel members. Laura Preble and I have 16 year old sons who were in the SAME class from fourth through eighth grade! Marlene Perez and I both have four kids, are at least slightly sleep-deprived and like Thai food. I'm aiming to be as thoughtful and professional and put-together as Mary Pearson. Also, I want a skirt like hers. Oh, and Mary can drink a lot of iced tea. Cindy Pon? Well, she has a wicked sense of humor, is refreshingly honest and has no sense of direction. 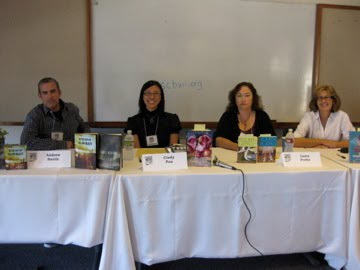 This is Saturday's author panel at the Poway Library. Also a very fun time and I enjoyed meeting Andrew Smith. As the only male around, he kept us on our toes. Plus, he had some GREAT one-liners. Which I will probably steal. I'll be at the Santee Library (9225 Carlton Hills Blvd, Santee, CA 92071, (619) 448-1863) with Cindy and Laura for a discussion on writing (informal and fun, I hope) and book signing this coming Friday, Oct. 23 @ 5:30. In fact, I have a little surprise gift for each of them. Today I met Cassandra. That's her in the photo above. And that's me next to her in my new orange sweater. 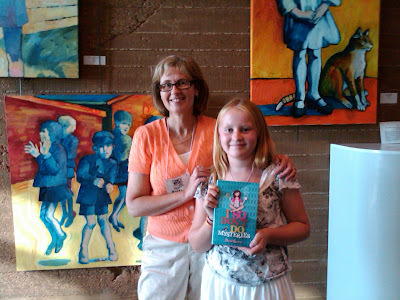 Cassandra came to an authors' panel held today in Encinitas. Meeting Cassandra was a wonderful opportunity for me. Because she is an expert on Sherry and company, having read I So Don't Do Mysteries five times. And, yes, my heart did speed up just typing that. Here's the deal. I did something very mean to Sherry at the beginning of I So Don't Do Famous, the book I'm working on. Very mean. Editor Wendy doesn't know about it. Nobody knows about it. Except for me and Sherry. And now Cassandra. I was thrilled to be able to confide in Cassandra, a real live avid reader, and to hear how she felt about it. Cassandra said it was okay to be that mean on one condition... No problem. I'm on it. Cassandra, it was a pleasure meeting you, and thank you for being there for Sherry and me! We have three toilets in our house. Two were sluggish. One was downright comatose. And I was throwing a party. It was either call a plumber or rent a port-a-potty. He snaked our toilets and offered a bowlful of drain tips. Which I'm passing along to you. 1. NEVER use Charmin toilet paper. No matter how tempted you are. Even if it's hugely on sale. Even when they tell you it's ultra strong and ultra soft. Apparently, Charmin' is more like a kissing cousin to paper towel (thick) than to other brands of toilet paper (thin). 2. When you pay your rent/mortgage (that is, once a month), dump 1 cup of bleach down each drain in your house. Let sit for 30 minutes, then pour down hot water. 3. For sluggish toilets in high-calcium areas (like San Diego), pour ten seconds' worth or 1/4 cup of CLR down the little white pipe thingie (yes, this is a professional plumber term) under the lid at the back of your toilet. Let sit for 30 minutes, then flush. 4. For kids' parties, remove paper towel and Kleenex from the bathroom. 5. For kids' parties, only put out single ply toilet paper. And that, my dear friends, is a little (probably unexpected) practical advice from my corner of the world. This Monday, I'm playing catch-up. I promised a Hollywood post back in August. Which I neglected to deliver. Today's the day! Remember I attended the SCBWI national summer conference and met Editor Wendy for the first time ever? 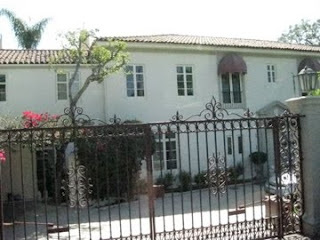 I took boatloads of pictures of celebrities' homes. Boatloads. Unfortunately, I can't remember who lives where! Isn't this a beautiful home? It might belong to Meatloaf or Courtney Cox or Harrison Ford or Keanu Reeves. Or none of the above. Sorry. Paparazzi I am not. Anyway, I did discover that I have something HUGE in common with Madonna. HUGE. As in she may be adding me to her Christmas card list. 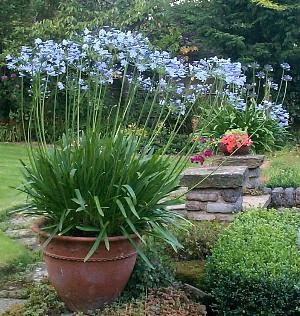 Madonna and I both grow agapanthus in our gardens. Yes, we're like gardening BFFs! 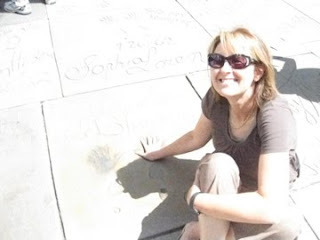 Part of the tour included time on the **Hollywood Walk of Fame** and at **Grauman's Chinese Theatre**. 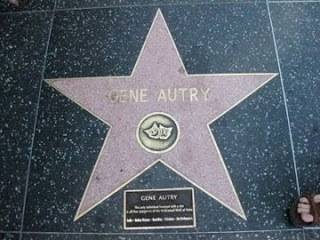 Here is ONE of Gene Autry's stars. He has the most stars of anyone ever--five (one in each category). This is a picture of the Live Stage Performers' category. 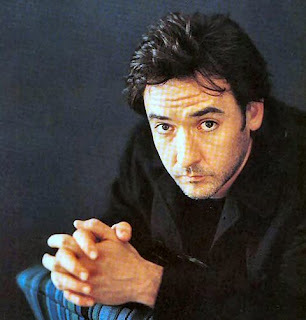 John Cusack is getting a star in 2010. I'm very happy for him. I've had a crush on him for a while. I'm hoping that John'll google himself (he seems like the type who would), read this post and invite me to the "Getting Your Own Star" ceremony. It would the chance of a lifetime for both of us, and I'm pretty sure I can spin it so that DH doesn't mind. 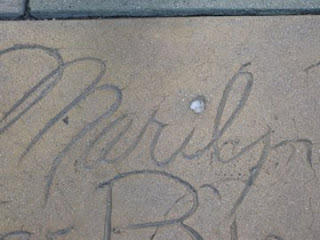 I'm measuring my palm against Marilyn Monroe's handprint. Perfect match! Natch! We finish off the morning with a humungous California salad for lunch. 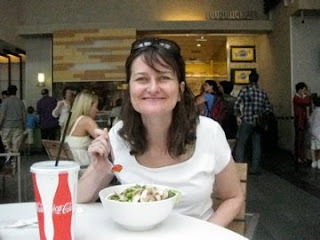 Here is Editor Wendy bravely tackling her over-sized salad. Seriously, I ate about a month's worth of lettuce in that one meal. Click here for links to more My Town Monday posts (some more serious than this one)! Also, if you're even mariginally thinking about writing a My-Town-Monday post, please do! Fair warning, though, it's addictive! Write your post, then leave a comment here and we'll link to you. Welcome to the NINTH meeting of The Book Review Club! That's a lot of books reviewed! That's a lot of cyber coffee and cyber cookies and cyber muffins consumed! That's a lot of cyber calories! I'll be completely up front and admit that I had a tough time settling on a book to present this month. Not that I haven't been reading. I have. Not that I haven't read some decent books this summer. I have. But somehow I just couldn't stick with a book. Until I decided to totally change gears. And visit my picture book shelf. Well, more like picture book bookcase. 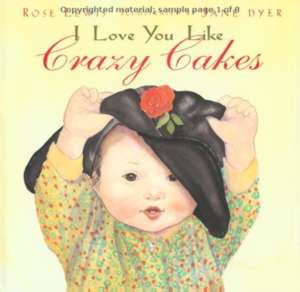 I LOVE YOU LIKE CRAZY CAKES by Rose Lewis (Little Brown & Co, 2000) is the story of a single woman's adoption journey. Once upon a time in China there was a baby girl who lived in a big room with lots of other babies. The girls shared cribs with one another and became great friends. The girls had nannies to take care of them, but each was missing something--a mother. Far away across the ocean was a woman who also had many friends, but she was missing something, too--a baby. That woman was me. Then, the woman talks about writing to China, then traveling to China, then finally meeting her baby. How did this happen? How did someone make this perfect match a world away? Did the Chinese people have a special window to my soul? I cannot read this book with tearing up. You probably can't either. The first time I read it to Child #3, he had a visceral response. And while the Korea adoption system is very different from its Chinese counterpart, the agency in Korea did match us up with Child #4. And every day, I look at this petite Asian girl living in a sea of blond-haired, blue-eyed rambunctious older brothers and wonder how a Korean social worker over 6,000 miles away managed to choose the perfect child for our family. So....swallowing past the lump, please visit the links below. The reviews will be thoughtful and insightful and encourage you to add to your TBR list. As for me, I'm off to the grocery store to get my flu shot, but will check in regularly today. Jody Feldman: DYING TO MEET YOU by Kate Klise (middle grade) *sounds heavy, but according to our review is "totally cute and wonderful"
Linda McLaughlin: LIPSTICK JIHAD: A MEMOIR OF GROWING UP IRANIAN IN AMERICA AND AMERICAN IN IRAN by Azadeh Moaveni (memoir, can also be classified adult memoir). Sarahlynn of Yeah, but Houdini didn't have these hips: a surprise video about books. Very humorous! Note to Reviewers: I think I was pretty organized this month and included everyone with reviews. But if I missed you, leave me a comment and I'll rectify the situation straight away. And award myself one less cookie today! Yay! It's Monday. Which means another My Town Monday post. And double yay! It's October. Which means Halloween, that uber fun holiday with treats and costumes and jack-o-lanterns. Today, I bring you a true mummy story from Lemon Grove, a town of about 25,000 people, located roughly 12 1/2 miles southwest of me here in San Diego County. 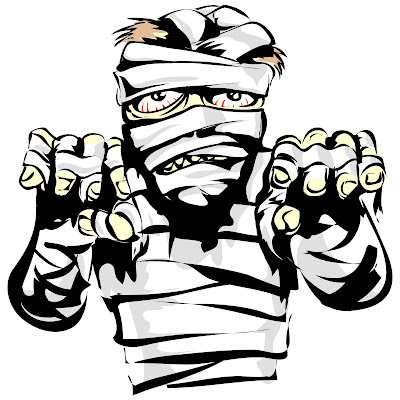 In the mid-sixties, two male San Diego teens decided they'd like to be the proud owners of a mummy. Now, I can totally see this happening. This past Saturday evening, we had ten 16 year olds in our living room. I'm sure if, when offering pizza and snacks, I'd said offhandedly, "There's a mummy in the trunk of my car, would anyone like to take him home? ", at least a couple of the teens would've stampeded me in an effort to get to the car first. Lo and behold, they find, not one, but TWO mummies: a 15 year old girl and an infant girl. The boys successfully smuggle the mummies across the border and back to San Diego when it suddenly occurs to them that perhaps their parents won't jump up and down with joy when their sons show up at their respective front doors with stolen Mexican mummies. So, the boys do exactly what you expect them to do. They call a friend and ask if they can stash the mummies in his garage. FOURTEEN years later, the boys' friend's mother decides to clean her garage. First off, can I interject to say that any woman who only cleans out her garage every fourteen or so years is an automatic friend of mine. Second off, can you just imagine the scenario? You're minding your business in your own garage, rearranging some sprinkler heads or a bucket of bolts or a few rolls of duct tape, when--YOWZER!--you stumble across a couple of mummies! Anyway, the woman calls the cops because she thinks there's been two murders. The cops realize the corpses are actually mummies. The all-grown-up teens confess. A San Diego museum asks the Mexican government if they can keep the mummies and put them on display. The Mexican government replies, "Si." I'm not sure what happened to the infant mummy. 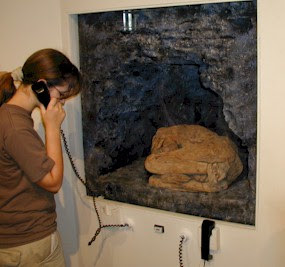 But the mummy dubbed "Lemon Grove Girl" is still on display at the Museum of Man in Balboa Park. And she's the only STOLDEN mummy on display in the ENTIRE world. Here's Lemon Grove Girl, in her curled burial position. She probably died between A.D. 1040 and 1260. You can find her in the Ancient Egypt and Mummies Display at the Museum of Man. And that, my dear friends, concludes another My Town Monday post from San Diego. For links to more My Town Monday posts, click here. Also, if you're even mariginally thinking writing a My-Town-Monday post, please do! Join in! We'd love to have you! Leave a comment and we'll link to you. Look! She's leaving dead skin behind as she moves across the branch. Even her face is peeling off! She has laid 23 + 42 = SIXTY-FIVE eggs in a little over THREE months' time. 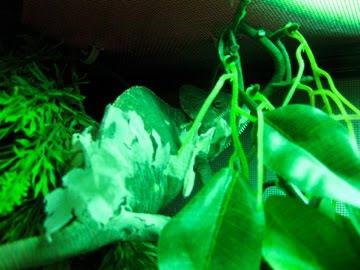 I think our little veiled chameleon is one smart cookie with a master plan. She doesn't want to look cute, foxy and appealing. She wants to turn attention away from the allure of her wandering eyes and the adorable bump on the top of her head. She wants a major break from motherhood. She wants the male to stay in his corner of the cage! And for those of you who were wondering...my little section of San Diego County has been on red flag warning* since Tuesday morning. It ended 18 minutes ago.